For other uses, see Palace of the Republic. The Palace of the Republic in September 1990, one month prior to German reunification. The Palace of the Republic (German: Palast der Republik) was a building in Berlin, Germany, that served as the seat of the Volkskammer, the parliament of the German Democratic Republic (East Germany or GDR), from 1976 to 1990. The Palast was located on Museum Island in the Mitte area of East Berlin, on the site of the former Berlin Palace between the Lustgarten and Schlossplatz, near the West Berlin border. The Palast was completed in 1976 to house the Volkskammer, also serving various cultural purposes including two large auditoria, art galleries, a theatre, 13 restaurants, a bowling alley, a post office, and a discothèque. Despite being outlawed 5 years before construction in the GDR, the Palace of the Republic or 'People's Palace' contained over 5000 tonnes of Asbestos. In 1990, the Palast became vacant following German reunification, and in 2003 the Bundestag voted for its demolition and the reconstruction of the Berlin Palace in its place. The Palast was demolished between 2006 and 2008, and construction of the Berlin Palace began in 2013. The Palace of the Republic (German: Palast der Republik) began construction in 1973 with a cost stated at 485 million East German marks, according to an internal list of Wolfgang Junker, the Minister of Construction, although other estimates suggest about 800 million to 1 billion marks. The Palast was built on the site of the Berlin Palace (Stadtschloss), the former royal palace of Prussia, located on Museum Island in East Berlin, less than 2 kilometers (1.2 mi) along Unter den Linden from the West Berlin border at the Brandenburg Gate. The Berlin Palace had been controversially demolished in 1950 after suffering extensive damage during the Battle of Berlin in World War II, as the government had no budget in the post-war years for the restoration and it was viewed as a symbol of Prussian imperialism. The site was used as a parade ground and parking lot during the 1950s and 1960s until its designation as the location for a new building to seat the Volkskammer, the unicameral legislature of the GDR, which was provisionally seated at the Langenbeck-Virchow-Haus at 58/59 Luisenstraße. The Palast was designed in a modernist style by Heinz Graffunder and the Building Academy of the German Democratic Republic (Bauakademie der DDR), with distinctive bronze-mirrored windows as a defining architectural feature. It consisted of two massive outer blocks and a middle piece inserted between them, which together gave the building the shape of a cuboid with a length of 180 meters (590 ft), a width of 85 meters (279 ft), and a height of 32 meters (105 ft) which was based on that of the neighbouring buildings. The new building took up the eastern half of the plot while the western half was intended as a military parade ground, though tremors from the heavy vehicles were found to endanger the glass facade. Instead, the western half was used mainly as a parking lot and military parades were moved to Karl-Marx-Allee. In addition to housing the Volkskammer, the Palast was intended as a multiple-use structure influenced by the concepts of Palaces of Culture and People's Houses popular with socialist movements. The Palast contained a large bowling alley at the lower level, from which the canal-side terrace along the River Spree could be accessed, and featured Brunswick lane equipment and a bar. It was the first building in the GDR to feature a self-supporting steel skeleton and contained 5,000 tons of asbestos used for fire protection. The Palast was officially opened on 23 April 1976 and its facilities were opened to the public two days later. Numerous important cultural, political, academic, and social events of the German Democratic Republic occurred at the Palast after its opening. [unreliable source] Concerts of famous orchestras such as the Gewandhausorchester Leipzig under Kurt Masur, modern interpretations of classical music such as the Messiah of George Frideric Handel, and performances by Bulat Okudzhava (29 November 1976), Harry Belafonte (25 October 1983), Karel Gott (1983,  1986 with Dara Rolins and Heidi Janků, , 1987 ) or of the rock-band Purple Schulz (21 January 1989). German electronic music group Tangerine Dream performed a concert recorded live at the Palast on 31 January 1980 which also was Johannes Schmoelling's first live performance with the band. The concert was unique in that Tangerine Dream was the first Western group who was allowed by the GDR government to play in East Berlin at the time and was dubbed "the performance behind the Iron Curtain". An album of this recorded concert was released titled Quichotte on East German record label Amiga, and later released to the rest of the world on Virgin Records six years later and renamed Pergamon. In October 1983, the West German rock star Udo Lindenberg was permitted to perform in concert at the Palast. At the concert, Lindenberg did not sing one of his best-known songs, "Sonderzug nach Pankow" ("Special Train to Pankow"), which satirized East German leader Erich Honecker, as he was asked not to play it. The Socialist Unity Party (SED), the ruling party of the GDR, held party congresses at the Palast and a state gala was held on the eve of the 40th (and final) anniversary of the GDR in October 1989, at which Soviet leader Mikhail Gorbachev was present. During the night of 22–23 August 1990, the Volkskammer decided in the Palast on the accession of the GDR to the Federal Republic of Germany with effect from 3 October 1990, known as German reunification. The Palast had many nicknames in the Springer press in West Berlin and among East German citizens, such as "Palazzo Prozzo" (a wordplay, as 'protzen' means 'to show off') or "Erichs Lampenladen" (Erich Honecker's lamp shop). Beginning in early 2004, the Palast was used for events such as housing an exhibition of the Terracotta Army and a special concert by the famous Berlin-based band Einstürzende Neubauten. Demolition started on 6 February 2006, and was scheduled to last about fifteen months at a cost of €12 million, however, the demolition lasted longer than scheduled because of hazards to neighbouring buildings. Dismantling of the structure was seriously delayed after more asbestos was discovered in various locations, and the estimated completion date was pushed back to the end of 2008. About 35,000 tonnes of steel which once held this building together were shipped to the United Arab Emirates to be used for the construction of the Burj Khalifa. Although the original structure in Berlin has been demolished, its sister building, the Kulturpalast [de] in Dresden, is still intact and currently used as a symphony orchestra hall. In January 2006, about two years after the Bundestag decided for the rebuilding of the Berlin Palace, and second definitive vote re-approved the plans. It was decided three of its sides would be exact replicas of the original, but the fourth side and interior would be modern. Called the Humboldtforum, the rebuilt palace will house the Humboldt collection and gallery of non-European art. [unreliable source] In November 2008, the Italian architect Francesco Stella was chosen for the project. 16 monumental pictures by GDR artists presented Dreams of Communists: Walter Womacka, Willi Sitte, Wolfgang Mattheuer, Werner Tübke, Bernhard Heisig. The pictures were shown in Potsdam 20 years later. .
Erich and Margot Honecker at the banquet-ball for the Palace's opening in 1976. Palast der Republik in 1977 with the Fernsehturm in the background. The famous entrance foyer of the Palace and its many lights. Opening addresses are given in the Palace's central hall at the start of East Germany's 11th Party Congress in 1986. The remains of the central hall in 2003 following the removal of all asbestos and interior furnishings. The Palast der Republik during its demolition in September 2007. 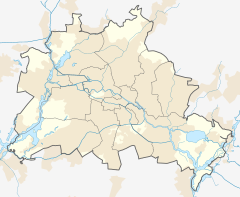 ^ "Category:Events at the Palast der Republik - Wikimedia Commons". Commons.wikimedia.org. Retrieved 2012-11-07. 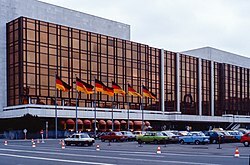 Wikimedia Commons has media related to Palast der Republik. Stop motion video of the demolition of the Palast der Republik.